It was on one of my lunch hours when I wandered into Boots and spotted the Library of Fragrance perfumes spread across two shelves, I recognised them straight away as at the time they'd been blogged to death! Unbelievably they offer over 300 fragrances, with 101 of them available in the UK and probably about 40 or so in my local Boots. I have to say though, even 40 seemed like a bit of an overwhelming choice, I think I'd pass out if I walked into find all 300! Luckily for me, Boots had the 2 for £25 deal on at the time and I was itching to get something fairly similar to Chloe, with the same base tones, something a little powdery. I spotted Baby Powder, conveniently enough, had a little spritz and fell in love - I just had to have it. Unfortunately, they only had the tester left. Why?! To compound my misery, I also noticed their Oud fragrance. Tester only: "Oh, please!!!" I left that day, excited by the possibilites, but disappointed that I'd have to save it all for another day. No matter though, a couple of weeks later I trotted back into Boots and Oud was back in stock - hurrah! But... Baby Powder was still sold out. Curse my luck. Anyway, I opted for Jasmine instead which turned out to be an inspired choice. I love the smell of Oud, it just oozes of intense Arabian richness and luxury. I'm instantly taken back to days spent walking through the souks of Dubai, Egypt and Istanbul. It really is a powerful, unmistakable scent and Library of Fragrance have captured it well. It isn't as strong as your more traditional Oud scents, or certain other Eau de Parfums but it does what it needs to - it offers a small, light and refreshing glimpse into another world. Enough to make you feel good and bring back those memories, but not too much to blow you away. If you happen to be looking for something truly powerful and intense, I'd recommend Oud Ispahan by Christian Dior. I was put on to it by Sheenie when I travelled to London for an iftar with her and a group of friends, she was sat a couple of seats away from me but I could smell her perfume over and above the Indian cuisine we were tucking in to! 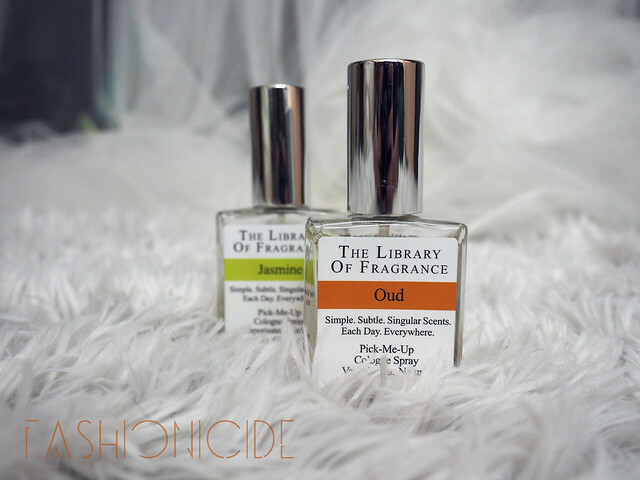 Library of Fragrance's Oud is nowhere near on that level, but in fairness it does come at a fraction of the price. As much as I love the Oud fragrance, I much prefer the Jasmine. I find it's much stronger and seems to linger on endlessly. I first spritzed it onto my scarf, and still days later I could smell it quite strongly. Naturally, it smells of Jasmine, an intense floral scent that invites nostalgia to take you by the arm and whisk you away in to a world of treasured memories. It really reminds me of when I was younger and my mum would light up some Jasmine scented incense, or when she'd massage my hair with Jasmine oil. I'm sure she'd still do it now - If I'd let her! But for me, that's the great thing about fragrances, they have an incredible hold over the human mind, able to recall memories that you thought were lost in the mist of time. A good fragrance will enter through the nose, find it's way to your brain and immediately trigger the happiest of memories. The Oud fragrance worked well, but for me it was eclipsed by the sheer power of the Jasmine. 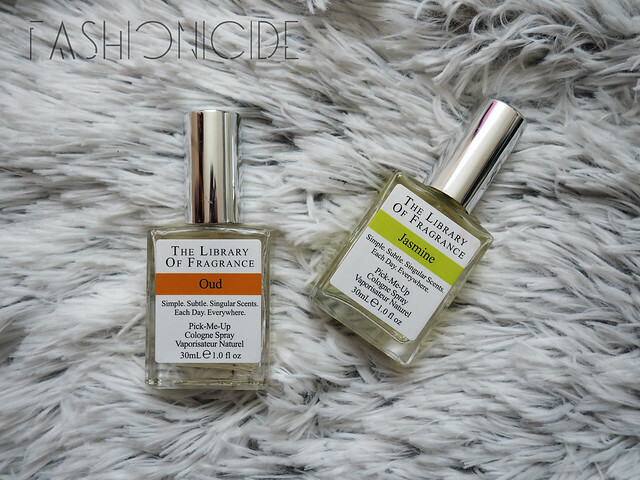 With those 300 fragrances out there, and 101 of them available in the UK, I sense that after testing the waters with these two, I'll be purchasing more from Library of Fragrance in the not too distant future. And with Boots seemingly having them up on offer every other week, It'd be rude not to! Tell me, which ones have you tried and fell in love with?